Following on from last week's post about Northern Leagues United, Saturday morning saw me heading North East for what was my first game of 11 a side football for at least a couple of years, maybe more. On arriving at the ground the first game of the day was about to get underway, between Birtley Town's Under 17's and Under 18's. My first task, getting acquainted with my team mates, many of whom I knew by their writing, their twitter names, but not by face. Introductions made and, in what seemed like no time at all, the PA announced we should be heading to the changing rooms. Directed to Dressing Room 1, which contained the kit of the young Birtley teams out on the pitch already, we instead made our way to dressing room 3. 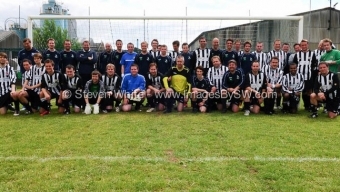 5 of us sat there, organiser Michael Hudson capturing the pre-match tension and nerves on camera. We waited….and waited. Where were our team mates? Where was our kit? The answer could be found in dressing room 3, where we had missed a seemingly inspirational team-talk from our coach for the day, Blyth Spartans assistant manager Gavin Fell. Quickly changed we joined our squad of 26 (never mind the quality, feel the width) for a warm-up. I think Gavin quickly sensed the warm-up was taking that much out of us we were at risk of pre-match burn-out and gathered us round for a final team talk. The gist of it being, relax on the ball, enjoy it and if you are knackered come off. There was plenty of (ahem) quality on the bench. The starting XI comprising many of the North East based writers who had at least managed a couple of training sessions beforehand. The match kicked off and, to be honest, we were on the back foot from the start. The Fans side benefiting from the quality of FA Vase winners Paul Chow and Paul Robinson of Whitley Bay. Despite this, during the times we pressed, we played with a fluidity of movement that even surprised coach Gavin. Whilst those of us who started on the bench were applauding, as Andy Hudson cut in from left of centre and fired in a shot, the boss just wryly smiled, muttering "He's supposed to be at right back". Iain Mackintosh, whose running style down the left wing was said to resemble Forrest Gump, provided early entertainment. It must have been tempting for the defence to knock a ball over the top of the fans' right back just to unleash Mackintosh's pace. Sadly he left his deft flicks and mazy runs in the warm up and departed the pitch with a moon at the bench….and his watching mother. When the first changes were made, there could only have been about 15 minutes on the clock and my first stint, taking over from the injured Stuart Fuller at centre back, saw me find my feet (or should I say my head) quite quickly - a deft defensive header back into midfield. From there on it is all a bit hazy. The absence from playing for most of the last 12 months and a general lack of fitness came into play. The mind was willing and knew where I needed to be, the body just wasn't able. A couple of times I saw Paul Chow break away and there was an inevitability about the goal, my body said "Don't chase back, save yourself". Yes, yes, selfish I know. I eventually asked to come off, knackered and sore. It was then I realised I had been on the pitch for all of 13 minutes. Breathless and shameful I propped myself up on the perimeter fence. Determined not to appear such a pathetic specimen I managed to recover quick enough to reappear on the pitch shortly before half time, only to see us go 3-2 down. When Chow and Robinson were off the pitch there was little between the two sides and each time we had gone behind, we drew level. But the three goals for the fans had Whitley Bay written all over them. Our goals came from our Polish football expert Ryan Hubbard, with a deft Boniek-esque finish past the keeper, and Neil Bellis. Successfully ignoring the claims of his twin brother Richard, he languidly took the ball forward before scuffing a daisy cutter (sorry), striking a sweetly hit shot from 20+ yards escaping the grasp of the keeper and inside the post. After an encouraging half time team-talk from the Gaffer - keep doing what we are doing, we are still in it, just relax and play, oh and can we have some better goal celebrations - the referee started the second half and I watched on from the back as we equalised again. A great finish from Paul Fraser of the Northern Echo, who ended up with the Man of the Match Award for our team. I have to say I would have given it to my fellow central defender Nick Loughlin (Sports Editor - Northern Echo). Playing virtually the entire game with several different partners he must have spent more time on the pitch than anyone and the scoreline didn't do justice to his performance and organisation.at the back. Or the fact he covered for my lack of fitness. Unfortunately, the qualities and skill of the Chow and Robinson combination again came to the fore and their interchanges and play had helped stretch the Fans' lead to 6-3, yet even their mid second half swap deal in exchange for the Bellis Brothers aka "The Crouchie Twins" (©The Gobby Woman in the Crowd) failed to swing the match back in our favour. Two or three gilt edged chances went begging, similar to those they had buried against us first half. In fact our biggest goal threat in the latter stages came from an unlikely source. Late on we won a corner and I went forward, sensing an opportunity for the kind of celebration Gav's half time team talk had demanded. As I made my aimless, mis-timed near post run dragging a defender out of the way, a space was created and a cry of "Tomasz" rang out behind me. The space was hit by our goalkeeper Tomasz Mortimer, burying a bullet header…………into the side netting. The bench were starting to celebrate, thinking it had gone in and I think if he had scored, Tom would be still charging arms aloft up the A1 now, just south of North Berwick. Shortly after the final whistle blew and I ended the game with a face redder than Sir Alex when the fourth official has come up a couple of minutes short on the injury time board. Little did I know, until I stopped at Scotch Corner on the way home that the redness was sunburn and the headache was sunstroke. Slightly heady from the heat I refuelled with Lucozade and chips n gravy and then shared cider and football chat with few fellow bloggers including Dave Hartrick and Jeff Livingstone from the superb In Bed With Maradona and Stuart Fuller of The Ball is Round and Andrew Gibney of The Gib Football Show. All whilst watching the final game of the day - Birtley Town v Ryton & Crawcrook Albion. By the second half I was stretched out on the grass, aching and not looking forward to the impending drive back. I am not sure what the final score was in the Birtley game, not that I wasn't interested, but I couldn't physically stand for a decent amount of time. So what did the day teach me? That you can put 2 decent players on a pitch and they can basically run a game and make you look quite foolish. Unless you take on my tactic - pass them on to a team mate and be the spare man. 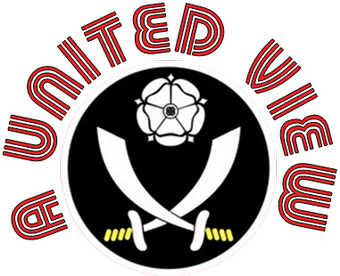 That football is more than just the hand-wringing, angst and pent-up frustration I have experienced watching the Blades over the last couple of seasons. That the online football community, both in terms of bloggers and fan interaction on twitter is a tremendous thing. 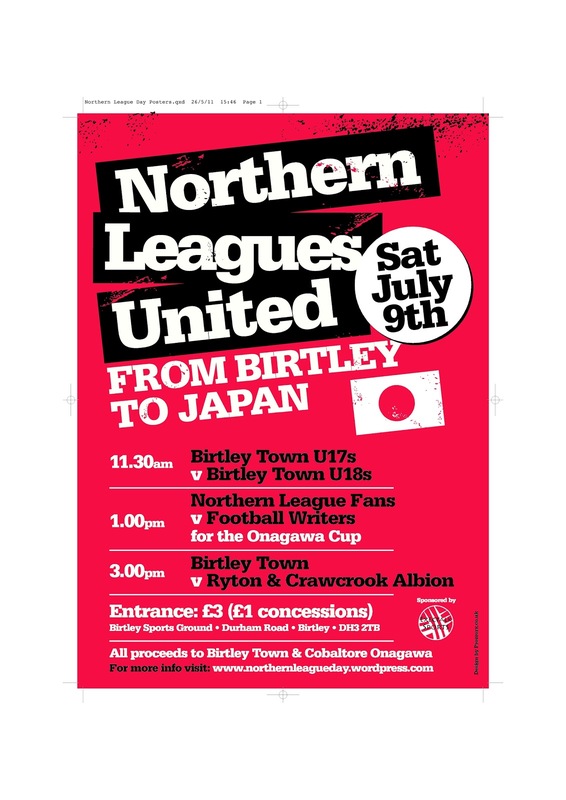 An opportunity to play football, socialise and do something positive for football and communities both in this country and in Japan drew not only people from the North East, but also Leeds, Manchester, Sheffield, Leicester, London……to name but few. At least 40 turned up to play, with many others turning up just to support and watch. It was a great day, one that was a pleasure to take part in and I hope that next year I am available to take part again. I promise to be fitter next time. Well done to Michael and Andy Hudson. Your time, effort and commitment were all so worthwhile. I typed this in-between tending to blisters and a swollen ankle whilst in Amsterdam and London hotel rooms. Painful, but a small price to pay for doing a little bit to help out a community who temporarily lost their football club but, more importantly, lost their homes, their friends, their loved ones and their own lives. Right, where did I put the Compeed plasters?